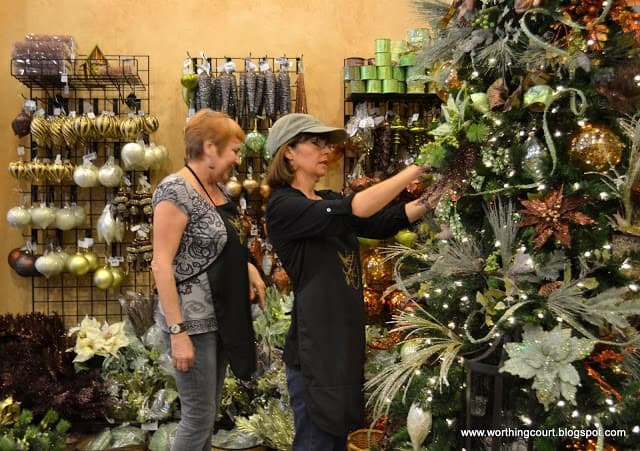 You may remember that I spent some time with the designers at Caryl’s Christmas Shop back in September as they started the process of decorating all of the trees for the store. My post “Designer’s Christmas Tree Decorating How-To” gave step-by-step directions for decorating your Christmas tree from start to finish. Sometimes it helps to see things in action, you know? So here is a video (with a whole lot more pictures than my post) that I put together of the whole process and thought you might enjoy. If nothing else, you’ll enjoy the music! If you are reading this via email, you will likely have to click over to my actual blog post to see the video! This is the first time that I’ve ever created a video, so please let me know what you think! Loved the video the tree turned out gorgeous!! I just love Christmas and all the glitz and glamour! Wow! What a tree! Great video and super informative! Thanks for sharing! Hi Suzy! Oh, I love this and they make it look so easy. The tree really looks pretty! Thanks for popping in to ee me. Thanks SO much for sharing that video with us, Suzy! Guess who (me!) has not even put up a tree yet so I can use some of those new ideas (like the large elements) this year on my tree to make it spectacular. I saw your post over at Susan’s Metamorphosis Monday. Nice article ..Good post ..Thanks for sharing..